Finding Serendipity is a first-class, well-written children’s book dedicated to the power of imagination. I love the premise of the book, which is that there is a land where all the stories exist, and that each story has a world of it’s own. It’s a great book for anyone, but especially for children who love writing and making up stories. I read this children’s book after I read the sequel, Week without Tuesday, and I do recommend reading them in order. This first book lays out the premise very beautifully. If you ever wished to have a children’s book which is compelling page-turner, this is good place to start. I was on the beach when I opened the book, and didn’t put it down until I finished it two hours later. And while this book is about imagination, it’s not just airy-fairy. Imagination can also evoke gory – pirates with crumbled bones and twisted heads. Normally a scene like that would send me running, but because it is so woven into the fabric of “this is all make-believe,” even a squeamish, sensitive reader like I am, was able to tolerate it. 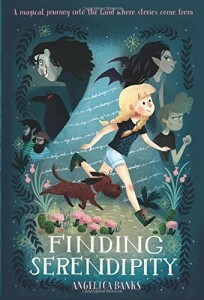 It’s also lovely to know that there’s a sequel to the book, and I would hope that we’d get at least one more children’s book from these talented Tasmanian authors. (Yes, plural – Angelica Banks is a pseudonym for two women.) Alas, with a girl protagonist, it may not attract enough boy readers. Sigh…we need more gender-free children’s books.